Many people have spoken about the negative effects of video games and how they elicit violence and sexism. Today, I want to talk about Telltale’s The Walking Dead, and the psychological effects this game has. Season three of this game is coming out soon, and this game has an amazing way of analyzing your character and eliciting empathy. 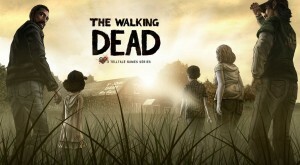 The Walking Dead is well known for being a game where your choices affect how your story plays out and how characters interact with you. Despite playing as a character, the game gives you such well written dialogue and actions to choose from, you really feel as though you are playing as yourself. Have you ever been frustrated with a video character and said something along the lines of “I’ll kill you/you’re dead to me”? This game gives you the opportunity to kill those characters, and when you are faced with that opportunity, it can show you a lot about your own character. And at the end of each episode, this game shows you a percentage of people who made each choice, so you can either feel reassured or guilty based on the choices you made. This game will make you question yourself, sympathize with others, and build real connections with these fictional characters. How can a video game connect with people so well and make them feel an amazing amount of feeling? This article outlines the psychology behind the game, breaking down the exact mechanisms this game uses on our psyhce. The main mechanism being mirror neurons, which are motor cells that cause us to move, but these particular neurons are also affected by other people’s movements, allowing us to empathize with other’s movements such as frowning or crying. This game has a very stylized animation, similar to how a comic book would play out. There are a lot of close ups to character’s expressions, the camera zooms in during dramatic scenes to display a character reaction to serious news. This also ties into how each scene is framed. Often times composition of artwork of scenes in movies affect mood. Diagonals are more appealing and interesting, as diagonal lines are more likely to take up more room than a straight line down the middle of the page or screen. Let’s look at this scene specifically. 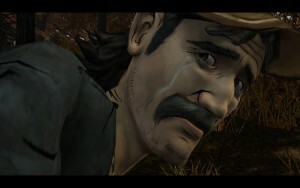 Here, Kenny is crying due to possibly the saddest death in the game. He is characterized as gruff and the main emotion he displays is anger, never really showing sadness or remorse. He is one of the only characters to cry in this game. Take a look at the color pallet, Kenny himself is made up of mostly cool colors besides his hat. The whole screen is covered in darkness other than his tears and the small flecks of sunlight shining through the leaves of the trees. His skin is shaded with a sort of blue-stone grey, giving his expression a sullen look. These cool and dark colors give this scene a very cold and depressing mood, as such colors and shadows tend to be associated with sadness. Because his facial hair and shirt are similar colors, they draw the eye around the screen, allowing the player to take in Kenny’s image fully. 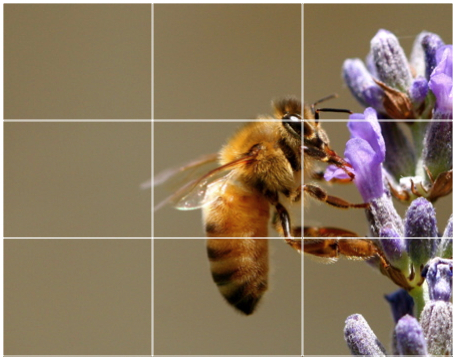 This also perfectly displays the rule of thirds, which is an important rule for artists. This rule allows the image to become balanced and fill up the complete image. Most amateur artists place the subject in the middle, allowing the piece to be too easily digestible, and giving the piece no interesting twist to keep the viewer observing. Here, Kenny’s eyes are the main focal point, really putting emphasis on his tearful expression, placed in the same place where the bee’s eye is. We can also observe that all of the diagonals are pointing to Kenny’s face as well, such as his body is tilted upwards, allowing his torso to point to his face. Through color theory and framing facial expressions in such a way that they cannot be ignored, this game puts a huge emphasis on emotions, and thus cause the player to mirror those emotions. This entry was posted in Uncategorized on December 1, 2016 by Savannah Stalnaker.